November 6, 2014, 7:54 PM · SEOUL — You don’t have to check the weather forecast before planning a visit to Lotte World. The (mostly) indoor amusement park in Seoul, South Korea, has been operating under protection from the elements for the past 25 years. Upon opening in 1989, Lotte World became the world’s largest indoor theme park. It’s also one of the planet’s most popular parks, welcoming about 7.5 million visitors in 2013 (which puts it just ahead of Universal Studios Florida and Hollywood for attendance). As with the Universal and Disney theme parks, Lotte World is owned and operated by a huge conglomerate: Lotte Co., Ltd., a company founded in Japan and currently based in both that country and South Korea. In addition to Lotte World, the Lotte empire includes candy companies, fast food restaurants, cinemas, malls, department stores, convenience marts and skyscrapers (the Lotte Super Tower 123 is currently under construction next to Lotte World and will be the tallest building in Korea when it’s completed). Also like most Disney and Universal parks, Lotte World is surrounded by an enormous entertainment and shopping complex, featuring a water park, an aquarium and many of Lotte’s other businesses, as well as luxury boutiques, hotels and a dedicated subway stop. Which brings me to how easy it is to get to Lotte World. The park is located in the portion of Seoul that’s south of the Han River, which saw rapid development in the decades immediately following the Korean War. The best way mode of transport (and this goes for 99 percent of Seoul attractions) is the city’s reliable, clean and inexpensive subway system. Signage and most announcements are in Korean and English, making the experience a breeze for Western travelers. Depending on where you’re staying in Seoul, the ride should cost between 1,050 and 1,250 Korean Won – roughly $1 to $1.20 U.S. at the moment. We stayed near Seoul’s city center and the journey took about 25 minutes to get to Jamsil station, the stop for Lotte World located on subway lines 2 and 8. From the station, you follow a number of obvious signs to Lotte World, walking through the basement levels of the Lotte Mall (and past a replica of Italy’s Trevi fountain). After a few minutes, the signs lead you to a small atrium festooned with pictures and models of cartoon characters, including the park’s mascots – Lotty and Lorry, a pair of raccoons in love. There are about 40 other Lotte World characters – from Maurice (who’s a pig and a wine expert) to Bawoo (a ringer for Droopy Dog) to Sharon Cat (who sports an unusual amount of cleavage for a feline). If you can make it past Sharon’s curves, the atrium opens up to an entranceway setup familiar to most theme park fans – counters where you purchase tickets and turnstiles to enter the park. Lotte World offers two main options for entry: a Daily Passport Ticket or an Admission Only Ticket. The Daily Passport allows access to all attractions (except some specialty ones, such as the haunted house assembled for the Halloween season, which cost extra) while the Admission Only option requires visitors to purchase tickets inside the park in order to experience those rides and shows. A Daily Passport costs 46,000 Won (US$44) for adults, 40,000 Won ($38) for teenagers 13-17, 30,000 Won ($28.50) for children 3-12 and 12,000 Won ($11.50) for those under 3. The Admission Only tickets are about 80 percent of those prices, which means they’re only useful if you plan on going on very few rides (which cost between 1,000 and 5,000 a pop). There are also discounted admission prices after 4 p.m. and 7 p.m. Seeing as we planned to check out more than three attractions during our day at Lotte World, we sprung for the Daily Passports. However, we did luck into a 10 percent discount off the admission price, because we had purchased Seoul City Pass Plus cards upon arriving in Seoul. The cards cost 3,000 Won a piece and function as rechargeable subway, bus and taxi transit cards. The Lotte World discount (4,600 Won) alone outweighed the original purchase price. In addition, the cards allowed for easier use of Seoul’s public transport systems, including free transfers and a 100 Won discount on every subway journey. After getting our park passes, we joined the relatively short lines of mostly teenagers waiting for the park to open at 9:30 a.m., just a few minutes away. The lack of crowds at opening (even though it was a Monday morning) was a big difference from our experiences at other major parks in the U.S. and Asia – certainly Tokyo Disneyland, where even off-season crowds begin forming 90 minutes before the gates lift. Lotte World opening right on time and, after making it through the turnstiles, everybody rushed… to stand on an escalator. Because Lotte World is indoors, the park makes greater use of vertical space. Attractions, shops and restaurants aren’t divided into differently themed lands so much as they are located on different levels. As such, the entrance is located one floor beneath the park’s main area. An escalator carries you to the giant, four-story tall space, which feels larger than the biggest sports arena (and much more vast than the park in the middle of the Mall of America). A glass dome covers most of the ceiling and allows for the park to be lit by natural light. In addition, some of the glass panels can be opened on days with decent weather, allowing a breeze to flow through the indoor park. An all-girl marching band played as we took in our first glimpses of Lotte World: an intricately detailed European village area with towering structures in front of us, an Arabian square behind us, a gargantuan performance stage next to that area and a series of caves sprawling up the wall to the right of the stage. In middle was a small, ornamental castle floating above an ice-skating rink two floors below (filled with small children in yellow helmets practicing their short-track speed skating skills – watch out, future Olympians!). The grayish-blue walls must be intended to simulate the sky, or at least fade in the background, but they cast a drab feel on the park, particularly on an overcast day. It seems like a lost opportunity to leave the walls undetailed, instead of creating backgrounds that would add to the theming and, perhaps, provide greater separation between disparate areas. Many of Lotte World’s attractions are accessible from the main area, although some are located in “Underland,” a loosely underground-themed area on the same level as the entrance. A few others, including some of the park’s most in-demand rides, can be found on the second, third and fourth floors, behind the walls of the central space. There are multiple elevators as well as sets of escalators to take visitors from level to level. The endless escalators at Universal Studios Hollywood notwithstanding, these metallic moving stairs make me think of shopping malls, which is an aesthetic that permeates Lotte World. It’s surrounded by a mall, shares restaurants with a mall and, when you’re riding an escalator to get from a roller coaster to a water ride, just feels like a mall. If you like both malls and theme parks, then you’ve met your dream park. If, like me, you like one way more than another, you might experience some mall fatigue. If so, you can break out by visiting Lotte World’s outdoor extension, Magic Island. Because it was raining fairly hard on the day we visited, we were told at the gates that Magic Island wouldn’t be operating. However, by mid-afternoon, the rain had nearly stopped and park employees allowed visitors to traverse the bridge that crosses a busy city street into the small outdoor land, which features a Disney-like, blue-turreted castle as well as a smattering of both kid-friendly attractions and thrill rides. Lotte World’s 45 attractions features a range to serve every age group. There’s kiddie fare, such as the excellently named Swing Pang Pang and Boong Boong Car. There are rides geared to the entire family, which, believe it or not, include the spinning Drunken Basket and the Aeronauts Balloon Ride that travels along the ceiling. And, of course, there are more thrilling experiences like the Gyro Drop, Gyro Swing and Gyro Spin (you might say Lotte World has more gyros than a Greek diner – hi-yo!). On one hand, the park features standard amusement park stuff like a carousel and bumper cars. On the other, it’s the only theme park I’ve ever visited that includes a full-fledged folk museum in the price of admission. During our visit, we endeavored to try Lotte World’s most unique features. Below are the attractions we found the most interesting. Dragons Wild Shooting – The concept is all there in the name. In this attraction, you and the other three people in your car journey through a castle, attempting to rescue it from a horde of bug-eyed dragons. The ride is kind of a mix between Toy Story Midway Mania and Buzz Lightyear’s Astro Blasters, as riders point their laser guns at three-dimensional dragon models as well as screens full of the little creatures. Dragon Wild Shooting is a briskly paced and gorgeously themed attraction that’s also a lot of fun. I was surprised that wait times never seemed to exceed 10 minutes during our visit, while others – like the pretty basic Flume Ride – had queues longer than an hour. Maybe it has something to do with the fact that Lotte World contains no less than three shooting attractions. Desperados II – Speaking of shooting attractions, this Wild West shoot-’em-up is located a few feet away from Dragon Wild Shooting, but delivers an entirely different experience. Desperados II (no, it’s not a sequel to the Antonio Banderas movie) lets you saddle up on your choice of a couple dozen fake horses placed before a giant screen. Wearing 3D glasses and brandishing a Colt .45, you hunt down a band of criminals while your horse “gallops” away in time with the action on screen. With a theater full of people shooting at the same screen, the experience is more than a bit manic (your horse’s number appears with your shots on the screen, which kinda, sorta helps). As long as you’re not too serious about your score, Desperados II makes for a wild adventure, and one we found worthy of a repeat. French Revolution – We did not feel the same about Lotte World’s indoor coaster, named more for the “revolution” the trains makes in the track’s sole loop than for anything involving the French uprising (yes, we were hoping for a giant guillotine and a “storming the bastille” section). There are a couple of murals of Paris at the loading station, but otherwise this is a pretty simple steel coaster that provides a few thrills as it darts in between the park’s tightly packed attractions and scenery. Two caveats: my wife is taller than the average Korean and found that the padding on her seat back and harness hurt more than helped during the rickety ride. Also, because the track is short, French Revolution only runs one train, forcing lines to grow to an hour-plus wait rather quickly. If you’re determined to ride, do so early. Comet Express – We found this coaster – located in the outdoor Magic Island section, but contained completely indoors – to be a much more charming experience. Riders line up for a trip through space on a wild mouse coaster (sound familiar, Disney fans?). Actually, given that the two-person cars rotate throughout the journey, the ride reminded me of Universal Studios Japan’s Space Fantasy – although that attraction featured fantastic special effects, while Comet Express contains day-glo decorations that are barely a step up from a park district’s haunted house. Still, the coaster provides one of Lotte World’s most unpredictable and thrilling rides. I was happy that Magic Island opened by the end of our day so that we had the opportunity to check it out. Atlantis – Also located in Magic Island, but unfortunately down for maintenance during our visit, is the Atlantis roller coaster. It’s billed as a mixture between a flume and a coaster, I suppose because the single-car sort-of resembles a flume boat and the ride area contains a number of close-call water elements. After only being able to look at the track and the excellently detailed mountain structure it cuts around and through, I checked out a full ride video once I returned to our hotel. Looked like fun. Sorry we missed it. The Adventures of Sindbad – Not to be confused with Tokyo DisneySea’s Sindbad’s Storybook Voyage (a.k.a. the most charming ride ever), this Sindbad attraction takes its inspiration from other Disney classics. The boat ride takes as many of its cues from the Sindbad legends as it does from Pirates of the Caribbean, the Haunted Mansion and Splash Mountain. And, like those, attractions, the Adventures of Sindbad is an impeccably themed attraction of cinematic scope and epic length (just when you think the ride’s about over, it kicks into a whole second half). It packs just about every piece of Sindbad lore into the experience. Three-headed dragon! Sword-fighting skeletons! Teleporting genie! Plus, as a Disney fan, it’s fun to spot the homages (which I prefer to “knock-offs,” given that this is obviously a loving tribute). Two birds taunting riders from above! Talking skulls! “Turning” busts! While Sindbad’s atmosphere and ambition are first-rate, the execution is sometimes lacking. None of the audio-animatronic characters are up to Disney standards and many appear in desperate need of refurbishment. Still, this attraction has lofty aspirations and it nearly meets them. Pharaoh’s Fury – OK, this one is definitely a knock-off. The Egyptian-themed experience takes its cues from Indiana Jones Adventure, down to the jeep-like EMV vehicles that passengers board at the end of a meticulously designed queue, which even features a pre-ride film reel). While the ride is fairly creepy (giant crocodiles, a cave full of bats and one vengeful mummy) and the theming is pretty good (climaxing in a treasure room of massive scale), the ride vehicle doesn’t whip around corners and dash through hallways as on Indy (or Dinosaur, for that matter). It’s a relatively slow-moving experience, which inhibits the ride’s intensity. Plus, for a ride that should be immersive, I question the choice to take the track outside of the temple of gloom. It’s a lot tougher to suspend your disbelief when confronted with views of a swinging pirate ship and a musical stage show. Or maybe that’s even scarier. Magic Pass – Here’s another Disney knock-off, only this time, it’s not a ride. Magic Pass is Lotte World’s version of Fastpass (at least the old-school, ticket version). Most of the park’s most in-demand attractions feature one (yes, only one), Magic Pass machine. It works the same was as a Fastpass, only your return time is merely a half-hour window. As with Fastpass, you can get another Magic Pass after your time arrives, or in two hours, whatever comes first. On the day we visited, Magic Passes were still available for most rides into the early evening with the notable exception of French Revolution, which seemed to run out by noon. In terms of food, Lotte World offers much of the same snacks you’d expect at any American theme park: popcorn, ice cream and churros. There is pizza (although some feature Asian-preferred toppings like seafood and mayonnaise) and hot dogs (albeit some that come with Korean twists like bulgogi – marinated beef – topping). There are also Italian eateries, burger joints and traditional Korean restaurants. I’m a sucker for the Japanese deep-fried pork cutlet called Tonkatsu (sometimes translated to Donkatsu in Korea, where it is equally popular), so we settled in for lunch at a restaurant called Mr. Pork. Two set meals, which came with udon noodle soup, cabbage slaw and more, plus two sodas set us back 26,000 Won (about $25 U.S.). Not a bad deal by Seoul standards. Service was quick and friendly, plus everything we were served was freshly made and delicious. We noticed as we sat down in Mr. Pork that the restaurant was shared between the theme park and people who were shopping at the mall area that surrounds Lotte World. We merely needed to show our tickets to get back in to the park. The good news is this opens all sorts of food options contained in the mall, Lotte World visitors aren’t “stuck” with what is offered in the park. As much as Lotte World takes its cues from Disney and Western theme parks, there’s still plenty that is quite Korean about this park. Although signage for almost everything is doubled in English (and often, the English version is displayed more prominently), the audio instructions and attraction dialogue is in Korean. Sure, you can usually figure out what’s going on, although you might be puzzled by some of the live shows – more on that in a bit. Lotte World sees relatively few foreign visitors, so the park is mostly filled with South Koreans, who have a different approach to public politeness than North Americans. In a city as crowded as Seoul, personal space is not as prized and so waiting in line can be a bit, well, cumbersome. If you motion for a bit more space, some Koreans will be friendly and accommodating, others will seemingly continue to attempt to fuse the front of their body with the back of yours. Fun. Also, by and large, children tend to be given a longer leash in Korea. It’s not surprising if a loud group of 10-year-olds or teenagers cuts you off while headed into a ride queue or even pushes you aside to make way for themselves. It’s not usually directed specifically at foreigners. During our time at Lotte World, we saw Koreans being equally “rude” to each other. Of course, to them, this is not rude, just normal, behavior. In contrast, we were given the most heartfelt – if quite strange – apology we’ve ever received in any theme park. While taking our second trip on the Adventures of Sindbad, there was a boat pileup midway through the ride, and we got stuck for a few minutes. After correcting the issue, we were greeted by the entire ride crew and a manager in a suit at the station. In a sign of deep embarrassment, all of them bowed deeply to us and our fellow passengers and we were given anytime Magic Passes to use on any attraction in Lotte World. As I mentioned before, admission to Lotte World includes a visit to a full-fledged Korean folk museum. While it wasn’t the most interesting museum we visited in Seoul, it was extensive with plenty of English translations for exhibits that displayed Korean history, crafts and innovation. The highlight was a massive model of a Korean palace and village during the Joseon Dynasty (1392-1897). The end of the museum also features a Korean food court and a few craft-laden souvenir shops – where a storekeeper attempted to get us to buy her chintziest items, like an I Heart Korean T-shirt. Now why would I want some gorgeous Korean pottery when I could have that? Before we finished our day at Lotte World, we took in a couple of the park’s seasonal attractions. 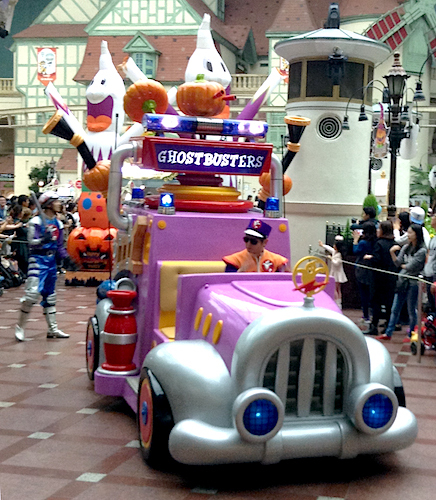 Lotty’s Halloween Party Parade featured a handful of orange and purple floats carrying the Lotte World characters in the Halloween costumes. 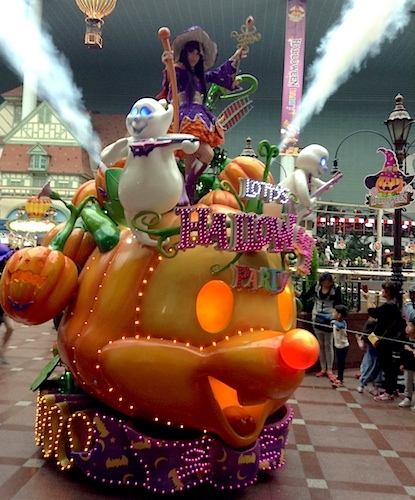 Unlike most of the rest of the park audio, the parade’s sugary sweet soundtrack was sung in English. It also featured a bizarro world depiction of the Ghostbusters (Helmets? Strange cartoony car? What?) as well as the skankiest dance costumes I’ve ever seen in a theme park. Are we sure this wasn’t Nicki Minaj’s Halloween Party Parade? That experience could only be topped by viewing the live musical performance of “Dracula’s Love” at the park’s Garden Stage. The entire production was in Korean, so I can only guess that the story revolves around a sword-wielding Dracula who swears vengeance against anyone who stands in the way of his conquest for females (or maybe he was just demanding a little more personal space). Then a bunch of the Lotte World characters got on the fog-covered stage and did a cutesy, prancy dance. Hurray for Dracula! And hurray for Lotte World, home to the biggest indoor theme park on the planet and some of the strangest park experiences I’ve ever had. But hey, it beat standing in the rain. November 7, 2014 at 7:53 AM · Thanks for the very detailed explanation ! November 7, 2014 at 8:37 AM · I have no plans to ever visit Lotte World or South Korea, so I'm especially glad I got a flavor of both by reading this really good article. I'm curious, though. Did the author travel to South Korea specifically to visit Lotte World? November 7, 2014 at 10:48 AM · Thanks so much for the review. It's great to see something completely different from what we're accustomed to with Disney and Universal. I have no desire whatsoever to visit this theme park, but I do think it's quite interesting. What I noticed is missing is any type of warmth. The floor especially, looks very cold and out of place. It would go a long way if they replaced some of those marble-looking tiles brick, or perhaps installed some high quality synthetic grass with some real flowers along the edges, and a lot more trees. It sure looks like the roof allows quite a lot of sunlight in, so I don't see why real foliage should be too much of a problem. It feels awfully uninviting to me. November 7, 2014 at 4:55 PM · I taught in South Korea for a year. I miss everything about it from the food to the people. Lotte World was great. I missed out on half of these rides though, half of them were closed down. Atlantis was the best! A gem of an attraction in a place full on unmemorable rides. November 8, 2014 at 1:01 PM · Bummer Atlantis was closed :( That ride seems so fun. I'm desperately trying to get a few friends together for a vacation to South Korea and Japan. Will most definitely be stopping at Lotte World!